A new monument is to be unveiled to mark the site where protesters stood in the way of vehicles getting on to a proposed nuclear waste depot in Bedfordshire after the old one was removed to build a roundabout. In the mid-1980s, the government wanted to bury nuclear waste in land at Elstow but backed down after protests. A monument was erected but the land is being developed for housing at Wixams. The new structure will be unveiled about 48m from the original site. In October 1983, the now defunct Nuclear Industry Radioactive Waste Executive (Nirex) identified the Elstow Storage Depot as a site for dumping low level nuclear waste. Bedfordshire Against Nuclear Dumping (BAND) was formed to fight the proposal, and in March 1986 a petition of 95,000 signatures was presented to the House of Commons. Nirex, the government's nuclear waste body at the time, said the site was chosen on geological grounds and disposal would be safe. BAND said it was too close to residential areas and transportation would be a hazard. The BAND monument was built in 1986 by its members as part of their protest. In May 1987, the government announced it was abandoning its plans for Elstow. 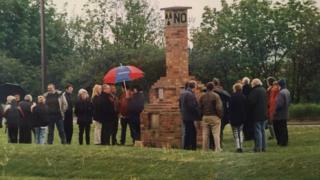 Andrew Jones, who was at the protests, said the original monument on Ampthill Road was a stone cairn in which they put a time capsule. It stood until earlier this year but "had to be demolished as it was in a fairly poor state", and needed to be relocated to make way for the Wixams development. Developers Gallaghers agreed to rebuild it nearby. The original time capsule will be reinstated and together with a new one in which past BAND members have been asked to add their own memorabilia. Mr Jones said the group was "absolutely delighted" it has been rebuilt "for posterity". "It was a concerted campaign which went on for quite a few years... but we were just indomitable... we just lived it," he said. "It was a tough campaign, we had writs served on us, we had bailiffs chasing us and it became quite nasty." The new monument will be unveiled on Sunday.